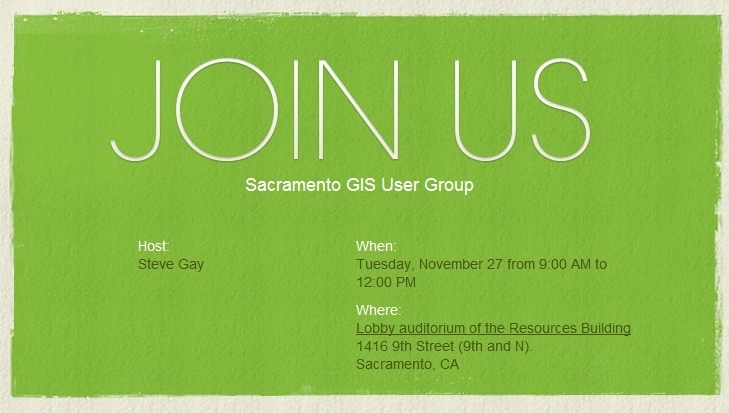 The Sacramento GIS User Group now has a linked in Group. Join us! Please join us from 9 AM to Noon on November 27th in the Lobby auditorium of the Resources Building at 1416 9th Street (9th and N). 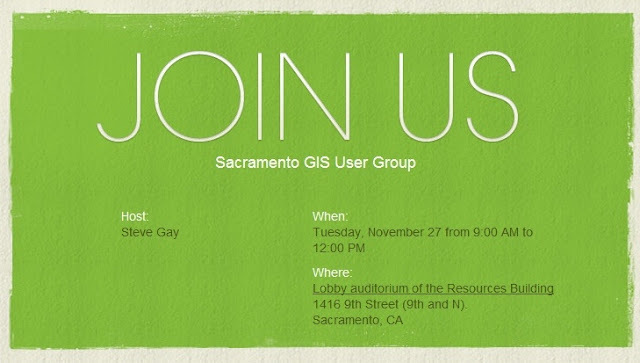 9:15am Tom Stopka, UC Davis -- "Spatial Epidemiology: GIS and Geostatistical Applications for Public Health"
9:45am Steve Goldman, Cal Dept of Fish and Game -- "Biogeographic Data at DFG: CNDDB, Vegetation, Range maps"
10:45am Steve Gay and Jason Latoski, Interwest Consulting Group, -- "ArcGIS Online: Architecture applications for a local Government"
11:15am Kellie Larvie, Cal Fire - "Wildfire Mapping"
Refreshments will be provided by Interwest Consulting Group. If your IT Dept does not allow access to meetup.com, sign up for email communication. Questions and comments regarding this blog? Contact MaryEllen at merosebrough@interwestgrp.com. Simple theme. Powered by Blogger.